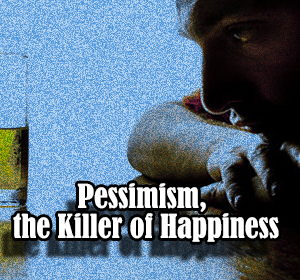 Pessimism, the Killer of Happiness - What is your answer to questions that ask the purpose of your life? Maybe some of us would answer happiness. However, not easy to be able to achieve happiness as expected, it is because happiness itself is invisible and intangible. In addition, the problems faced in everyday life, and the hope that is not achieved, sometimes regarded as the ringleader of separation between us and happiness. However, did you know that there is actually one of the most influential on us, related to the difficulty to be happy? It is pessimism, the number one killer of happiness, which makes people unconsciously have turned off the sense of happiness in his life. Why pessimistic could make happiness difficult to obtain? Before answering this question, it helps us know in advance, what is the meaning of happiness itself. Based on the opinion of experts of psychology, Sonja Lyubomirsky in his book The How of Happiness, happiness is an experience of joy, satisfaction, or well-being combined with a positive feeling better life, meaningful and valuable. Meanwhile, the famous philosopher Aristotle mentions that happiness in a person would have happened if he had achieved a major goal of his life. Furthermore, from the information about what and how happiness above, it can be a common thread, that happiness is closely linked to the achievement of a goal, which we know to achieve a goal, it takes effort. Well, from here there are two main points related to things that allow a person to happiness, that is the goal and effort. Then, try to think about this statement: "How could the goal be achieved, if a person feels pessimistic in their efforts." Defined as the act no hope, as a worry of inadequacy, fear of losing, or in other words diluting expectations, then fulfilled that, pessimism can be one of the main causes difficulty for someone to achieve happiness. Therefore, in an attempt to achieve happiness, things required being done everyone is trying to optimistic to achieve goals in life. And should be noted, though in an effort to achieve the goal, we have failed, never 'kill' the ideals of happiness in life with a sense of pessimism, to want to get up and try again. Thus, brief information that I can share this time. Hopefully, this simple article can be additional useful knowledge, for all of you.